Nat Howard, Doris' editor at the Cleveland News, went to the Union Club at 12th and Euclid every day for lunch. "The Union Club was very important to the three editors...there was Higbee's, Halles and The May Company. I think they divvied up the advertising over lunch at the Union Club� when those stores died, so did the papers." Doris remembers that he always had two martinis for lunch and then would take a cab back to work. He would always ask the cab driver what he liked to read in the paper. The answers were almost always the same; Cleveland Indians, Ed Bang, Ed McCauley and some others. When Nat came back from one lunch about January, 1956 he came in and told Doris she was going to Russia. 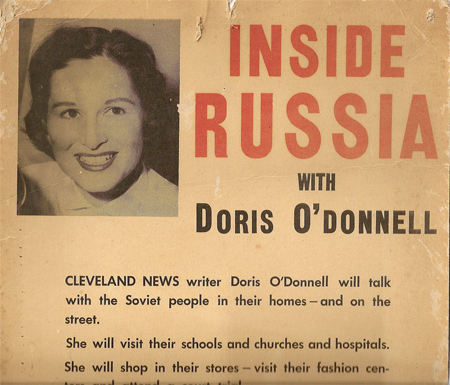 Cleveland had a Russian community and her assignment was to talk to the people of Russia, but not in a political sense. "Russia was such a secret society for so long there wasn't much up to date information [at the library]. When I did get information from the State Department it had things like wheat production and number of sheep. There was just no useful information on Russia anywhere." It took a lot of steps and time to get her Visa but by the end of April she was promised it would be forthcoming. In the meantime she went to Berlitz and learned some Russian "Just think if Google had been around at that time! But there wasn't much coming out of Russia. The only time Russians had really met Americans was WWII." When Nat Howard went to Cleveland Trust to take out $5,000 for her trip the head of the bank didn't want to give it to him. He didn't think the paper was acting responsibly by sending a "girl reporter" to the Soviet Union. That too worked out and her papers and rubles were in hand and she was on her way. She took Swiss Air. 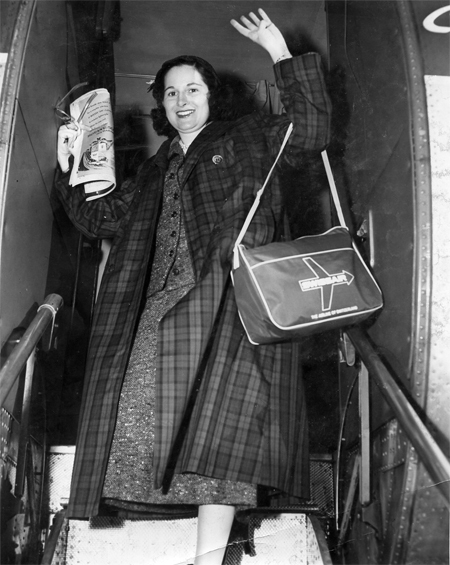 When she landed in Zurich she learned that the Russian Embassy would not honor her papers to enter The Soviet Union. However, soon, without knowing why, all of a sudden the embassy changed its mind and she was told when and where to go. 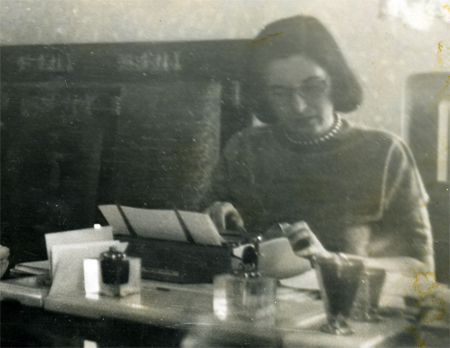 When she got to the passport check, they took her camera, her luggage her typewriter, her jewelry - even her watch. She was very forceful in insisting everything be returned - and eventually it was. 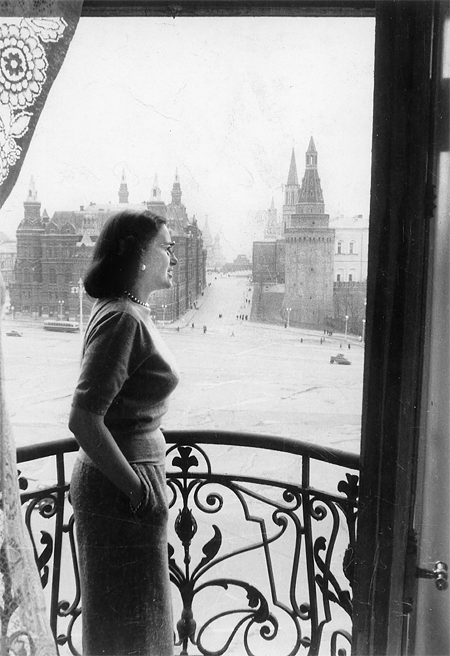 She stayed at the National Hotel, right across the street from the Kremlin, which she describes as "glowing with bright red stars". She was supposed to be met with an AP reporter, who stood her up. But she met his girlfriend, Josephine, who took her under her wing. Josephine took her to Arbat, "like the Coventry of Moscow" where they ordered a biff steak and coffee and talked about Moscow. Only eleven American press were in Moscow at the time and they invited her to a party. Irving R. Levine was there, as was Jack Russell, Daniel Shore - all from very big papers like the New York Times. 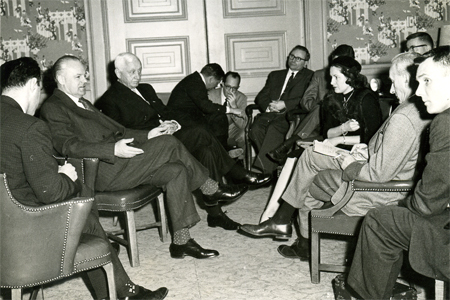 They all were amazed to find a female reporter from The Cleveland News in Moscow. She discovered that the reporters all had hired interpreters who would read the Moscow papers and relay the information to the reporters. The reporters would then send in their stories based on their interpreter's information. "They were not allowed to go any place in Moscow to get stories on their own. It was like a prison. Then they would write their stories� and take it to this old building. They would give their stories to the people there and then wait. They would get the stories back with the majority crossed out and they would have to re-write their stories." When Doris saw what was happening she called her editor in Cleveland and said the censorship was so tough and asked if it would be okay to write when she got home instead of filing stories. He told her to do whatever she thought was best and that was how she kept her stories from being censored. She told the head press man in Moscow that she wanted to go to a hospital, a school, a factory and a farm. She also said she wanted to ride on the Volga River. Of course, they told her that she couldn't do any of those things. She asked him to consider a compromise and to her surprise he actually did. He assigned her a guide and allowed her to take one other reporter with her, which she did. They went to a factory where they were making a car called a Zim, similar to an American luxury limousine. Stalin loved all things American, and wanted to outshine them in every way. He wanted bigger and better in all areas. He loved Eskimo Bars and everything American. A man approached her and spoke English. He used to work at Eaton Axle on a Russian/American exchange program to learn about Assembly Lines. Her fellow reporter asked if it was okay to file this story. She said go ahead, because she knew she would not be filing until she got home. She also knew that his story would never get through the censors - and she was right. Food was very scarce in those days. Everyone would carry an oil cloth with them. If they happened to come across a food store that was open they would get whatever was available - cheese, bread or sometimes even meat. While she was walking with her tourist guide they came across a store that was open and he went in to see what he could purchase. Doris decided to walk away while he was in the store. A lady came out, with two oil cloth bags, so she decided to follow her. Doris tried to explain that she was an American, but they did not share a common language. Stalin also loved skyscrapers and in 1956 was just beginning to build skyscrapers in Moscow. The woman Doris was following lived in one and Doris followed her into the lobby. "The poor woman was so scared of me. I kept saying Amerikanski and Cleveland Ohio, but it really meant nothing to her." When they got to her room a man answered the door and the woman ran right in. Doris told the man she was American and he answered, in English, 'please come in." He turned out to be one of the country's leading physicists. He took her into his kitchen; laundry was drying over the stove. "He was so nice and very apologetic about the condition of his apartment� He asked me tons of questions and I was trying to ask him questions. He knew who Cyrus Eaton was...we had a really nice visit." He gave Doris his contact information and they promised to stay in touch. When she got back to the hotel everyone was upset that she had ditched the guide. They assigned her a new guide - this time a woman. "She really stuck with me. I couldn't go to the [bathroom] without her tagging along." Together they went to a woman's magazine. "These women were really robust ladies and not at all fashionable. Everyone could tell I was American because I had American shoes and a rain coat." The women would all ask how many pairs of shoes she had and how many servants she had and did she live in a castle. They even wanted to feel the material of her clothes. Doris tried to explain her life and lifestyle. They were amazed that there were Russian churches in Cleveland. They couldn't believe anyone had gotten out of Russian nor could they fathom Russians living in a capitalist society right alongside the Americans. Doris asked them what they read. They knew all about Dickens and other British authors, but knew nothing of any American authors. More spoke French than English because they identified more with Europe than America. By contrast, Doris asked for permission to go to the Russian Ballet. Permission was granted and she was able to see Swan Lake. "This place was golden. The ballet was beautiful and the theater was breathtaking." Doris was there for about six weeks. Before she left she got her trip down the Volga River and got to see much more of Russian than most others.